The college admissions scheme revealed Tuesday is the largest of its kind ever prosecuted, federal prosecutors said, and features 50 defendants across six states, millions of dollars in illegally funneled funds and a handful of the country's most selective universities. But at its core, the alleged scheme is remarkably simple -- and brazen. Cheat on standardized tests. Bribe the people who decide which students get admitted. All the while pretending that money was for charity. "I'll speak more broadly, there were essentially two kinds of fraud that Singer was selling," US Attorney Andrew Lelling said, referring to William Rick Singer, the figure at the center of the scheme. "One was to cheat on the SAT or ACT, and the other was to use his connections with Division I coaches and use bribes to get these parents' kids into school with fake athletic credentials," Lelling said at a press conference in Boston. A total of 50 people were charged in the case. Those arrested include two SAT/ACT administrators, one exam proctor, nine coaches at elite schools, one college administrator and 33 parents, according to Lelling. Here's how the plan worked, according to prosecutors. Of course, students who score higher on standardized tests such as the ACT and SAT are more likely to get into selective colleges. Given that, Singer facilitated cheating on those exams for students whose wealthy parents paid for his services. Singer pleaded guilty in court on Tuesday to four federal charges and admitted that the case against him was accurate. According to the indictment, he arranged for a third-party -- generally Mark Riddell, who is charged with two conspiracy counts -- to secretly take the test in the students' place or replace their responses with his own. How did Riddell allegedly take the tests without being noticed by the test administrators? Well, prosecutors said, Singer bribed them. Igor Dvorskiy, who administered SAT and ACT tests in Los Angeles, and Lisa "Niki" Williams, who administered the tests at a public high school in Houston, are both accused of accepting bribes to allow Riddell to take the tests. Both are charged with conspiracy to commit racketeering, according to the indictment. Parents who hired Singer as part of the scheme allegedly paid between $15,000 and $75,000 per test, the indictment states. CNN has reached out to Riddell, Williams and Dvorskiy. by hrw.org --Aya Majzoub -- The sentencing of Lebanese TV correspondent Adam Chamseddine to three months in jail for “insulting” a security agency in a Facebook post is the latest escalation in the crackdown on speech criticizing public officials and state institutions. The prison sentence, the second issued to a journalist in absentia by a military court and one in a growing list targeting journalists, reflects all that is wrong with the continued prosecution of journalists for exercising their right to free speech. Chamseddine’s post criticized State Security for leaking details of an investigation of a detainee who had AIDS. Chamseddine claimed that the same State Security interrogators used a similar tactic with Ziad Itani, who was exonerated in 2018 of spying for Israel, knowing that in both cases, public opinion would turn against the suspects. There has been an alarming increase in the use of Lebanon’s criminal defamation laws, which authorize imprisonment for up to three years for insulting state officials and institutions. SKeyes, an organization that monitors free speech in Lebanon, recorded more than 90 prosecutions against journalists, artists, and activists since October 2016, with 62 in 2018 alone. Digital rights group, Social Media Exchange said the number of cases over online posts almost quadrupled between 2017 and 2018. Military courts have such broad jurisdiction over civilians they can end up in military court for any interaction with security services or their employees. Defendants, lawyers, and Lebanese human rights activists allege that authorities are using this power to silence dissent. Chamseddine is only one of many outspoken journalists, activists, and human rights lawyers who have been tried in military courts. Those who have been tried in military courts have described torture, forced confessions, incommunicado detention, lengthy pretrial detention, decisions issued without an explanation, seemingly arbitrary sentences, and a limited ability to appeal. Such trials violate defendants’ rights to due process and international law. In Chamseddine’s case, local media reported that he was tried in absentia because he failed to receive appropriate legal notice to appear for questioning or in court. The threat of arrest and the possibility of ending up before a military court have a deep chilling effect on critics of Lebanon’s government and state institutions. At a time when the state has failed to deliver even the most basic of services to its citizens and has engaged in serious rights violations, public debate should be encouraged, not persecuted. by cnbc.com -- Making good on a pledge to sever ties with Saudi Arabia after the murder of journalist Jamal Khashoggi, Endeavor talent agency on Friday returned a $400 million investment from the kingdom's sovereign wealth fund. The news, first reported by The New York Times, comes six months after Khashoggi's death. Endeavor, helmed by Ari Emanuel, announced back in October that it would be extricating itself from a deal with the Saudi government following pressure from Hollywood to stand against the kingdom. The multimillion dollar deal would have allowed the Saudi government to back entertainment projects at home and abroad and take a 5 to 10 percent stake in Endeavor, according to The Hollywood Reporter. Last year, Saudi Arabia's crown prince, Mohammed bin Salman, toured America meeting with Hollywood executives, celebrities and producers. The crown prince wanted to become less reliant on oil as the driving force of his kingdom's economy and to bolster Saudi Arabia's budding entertainment industry. However, Khashoggi's death led to a chorus of international outcry and caused a number of business leaders in the entertainment, tech and transportation industries to suspend talks or sever ties. Virgin Group's Richard Branson ceased talks about potential investments in his space-travel business, and private-equity firm Blackstone Group, Uber and Goldman Sachs all cancelled plans to attend a major investment conference in the Saudi capital. Read the full story from The New York Times. by dw.com -- Germany will not declare Lebanon's Hezbollah movement a terrorist organization, a top official said Friday. Minister of State Niels Annen told news magazine Der Spiegel that the Iran-backed Shiite Islamist movement is a relevant factor in Lebanese society and part of the complex political landscape in the country. 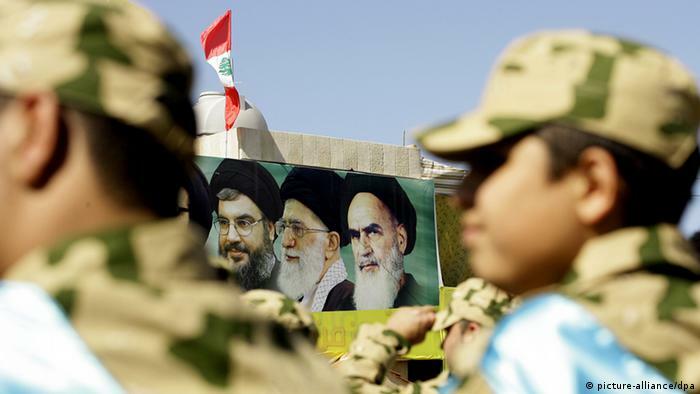 Read more: Iran's military power: What you need to know The comments come after Britain last month banned Hezbollah's political wing, accusing the movement of destabilizing the Middle East. "The British move is a national decision that has no direct impact on the position of the German government or the EU," said Annen, a top Foreign Ministry official. The European Union had already added Hezbollah's military wing to a list of banned terrorists groups in 2013. Hezbollah is represented in the Lebanese parliament and holds three of 30 ministries in the government led by Western-backed Prime Minister Saad al-Hariri. The movement's armed wing has expanded its influence in recent years in Lebanon and Syria, where alongside Iran and Russia it backs the regime of Syrian President Bashar Assad. In Lebanon, it is considered to be more powerful than the Lebanese army. Hezbollah, or Party of God, was conceived by Muslim clerics in the 1980s in response to the Israeli invasion of South Lebanon in 1982. The Shiite group has a political and military wing. As the once-powerful Islamic State (ISIS) crumbles, and its desperate fighters make a last stand in its final enclave surrounded by U.S.-backed coalition forces, its ideological leader is nowhere to be found. ISIS militants who have surrendered to coalition forces believe that Abu Bakr al-Baghdadi has abandoned the struggle when his leadership is needed most. His absence is causing deep fissures within the crumbling terrorist organization, which, though eroded, still boasts between 28,000 and 32,000 soldiers. “He’s hiding somewhere, people were angry,” Mohammed Ali, an ISIS fighter from Canada who was captured by the U.S.-backed Kurdish-dominated Syrian Democratic Forces, told The Sunday Times. The ideological appeal of ISIS and Islamic extremism remains, but Baghdadi’s leadership vacuum and the receding territorial losses of what’s left of ISIS holdings in Syria diminish the influence of the once-powerful organization. “Iraqi intelligence is following Baghdadi and we believe he never stays in one place for more than one day,” Abu Ali al-Basri, director general of Iraq’s intelligence office at the Ministry of Interior, told Fox News. “We have information he still moved from towns in Syria and entered the Iraq border through Anbar (province) with movement to bordering Salahuddin (province). Although Baghdadi remains far from the battlefield, he has continued to urge his loyal and ardent followers to carry on the fight. His most recent call to arms was in a series of audio clips released in August 2018. BEIRUT (Reuters) - Lebanon on Thursday warned its Mediterranean neighbors that a planned EastMed gas pipeline from Israel to the European Union must not be allowed to violate its maritime borders. Beirut has an unresolved maritime border dispute with Israel - which it regards as an enemy country - over a sea area of about 860 sq km (330 square miles) extending along the edge of three of Lebanon’s southern energy blocks. Israel is hoping to enlist several European countries in the construction of a 2,000 km (1,243 mile) pipeline linking vast eastern Mediterranean gas resources to Europe through Cyprus, Greece and Italy at a cost of $7 billion. by arabnews.com -- DUBAI: The family of a Lebanese student, who was killed in the UK’s northern city of Manchester, said they were expecting him home for tea when they got the knock at the door from police to tell them their son had been stabbed to death. Youssef Makki, 17, who was a student at Manchester Grammar School when he was stabbed in the chest on Saturday night, British national daily The Telegraph reported. Two unnamed 17-year-olds have been arrested and charged with his murder – it is thought they were known to the victim. Now the victim’s family have released an emotional statement expressing their grief. “Yousef was a loving and caring son and brother and he meant the world to his family,” the joint statement read. “He was a sporty young man, a dedicated student and so bright. He had everything to look forward to.” Makki lived with his mother Deborah, 54, and 15-year-old brother Mazen - his father Ghaleb is thought to be in Lebanon. “We are absolutely devastated and cannot believe that our son has gone. This senseless loss has affected the whole community. Yousef had only phoned home hours earlier to say that he would be home for his tea, but the next knock at the door were officers with the tragic news, it is every parent’s worst nightmare,” the statement continued. “We would appeal to anyone with information to contact the police and to help us find out what has happened on Saturday evening. Only recently had we talked about his promising life ahead of him and how he was looking forward to life. He was a promising student and loved by everyone,” the statement concluded. Dr Martin Boulton, the High Master of the school, said Makki was a “young man of such promise,” and said: "It is impossible to make sense of such a senseless act.” Makki was found conscious lying in the road after the attack by David Beckham’s former bodyguard, Paul Hughes. “He had one stab wound to the chest. He was half lying in the road and he was conscious and one of my guys was talking to him. At first, he was responding to what my security officer was saying," Hughes said. The UK is experiencing a significant increase in knife crime – there were 39 children and teenagers killed with knives in 2018 – there have been 10 so far in 2019.